Tom Clancy's Ghost Recon: Wildlands, the latest installment in the tactical shooter video game series is scheduled to release later this year. For the game, there are of course a Season Pass and three different game editions, with different additional content and other extras. In addition, the Season Pass contains all future DLCs. The plot of the game "Ghost Recon Wildlands" leads you to Bolivia, in a fictional future the Santa Blanca-drug cartel has turned the country into a narco-state. Normal state structures no longer exist and the Santa Blanca drug cartel has a free hand. So it's time for secret combat missions of the Ghosts fight against the cartel. Below we show you all editions and the contents of the Season Pass. In addition to the regular edition of the game, you will also have a choice of three special editions Deluxe, Gold and Calavera. Each edition offers you different extras in addition to the main game. The range of Tools also offers gaming accessories such as headsets and the official game soundtrack. There are also in-game extras: For example, maps, equipment, weapons and weapon accessories. 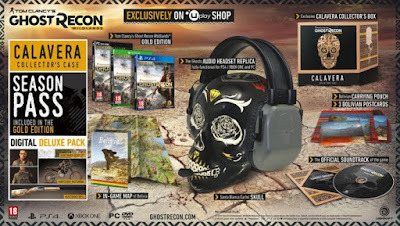 In addition, a pre-order bonus is offered for all special editions, the bonus includes the extra mission "The Peruvian Connection." 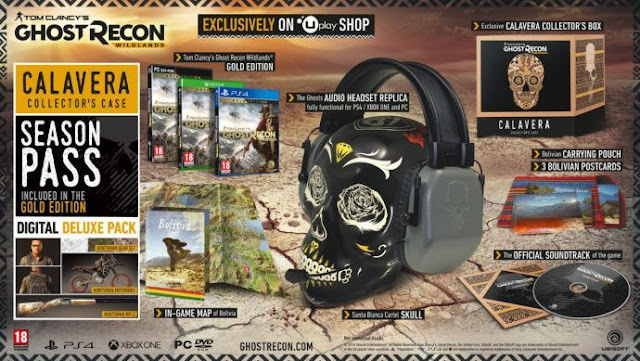 All editions of the game "Ghost Recon Wildlands" are available for PC, PlayStation 4 and Xbox One. The standard editions cost you $59.99. The Deluxe Edition as well as the Standard Edition will cost $69.99. There is also possibility to order the Deluxe Edition in Uplay store, in this case you will get additional 70 Uplay Units for the price of 100 Uplay Units and you get 20% discount on the purchase price. The Gold Edition will cost you $99.99 and in pre-order bonus you will receive an additional 100 Uplay Units for the price of 100 Uplay Units and you will also get 20% discount on the purchase price. The Calavera Collectors Edition includes a whole package of additional content and this for the price of $159.99. By buying this version you will also earn an additional 150 Uplay Units and then you have, as in the Gold Edition, the possibility for 100 Uplay Units and 20% discount on the purchase price. - Digital Deluxe package: It includes a hunting motorcycle, 1 vehicle skin, 3 character customization objects, 3 emblems and weapon camos 3 and EP-Booster. - By purchasing the Season Pass you get access to two main enhancements. The final purchase price of the Season Pass is not yet known. - In addition, there are also smaller DLCs with additional digital content, including exclusive new vehicles and equipment packages, as well as weapons and other game items. Play Rainbow Six Siege in Split Screen - is it possible?